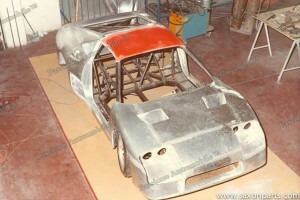 First non monoposto Ferrari to have a kevlar carbon composite body on a tubular frame. Important and influential, directly leading to the Ferrari 288 GTO Evoluzione, 288 GTO and ultimately the F40. Overview: A little-known Ferrari racer, but incredibly important competition car developed jointly by Michelotto and Ferrari as Ferrari’s FIA Group B rally contender. Due to the rapidly escalating costs and the technical and logistical demands required to compete at the top echelon of Formula One by the late 1970s, Ferrari focused its “works” racing efforts on this singular competition arena and increasingly formalized its relationship with the Michelotto tuning and racing organization, which owned the official Ferrari service center in Padova, Italy. To hard-core sports-car racers and fans, the name Michelotto carries a well-deserved reputation for its outstanding race-car preparation and dominant performances from the company’s inception in 1969, eventually becoming in effect a “semi-works” arm of Ferrari, preparing and racing every non-Formula One Ferrari to the present day. During the 1970s, Michelotto moved from strength to strength, using the rowdy Ferrari Dino-powered Lancia Stratos to great effect and winning a succession of Italian rally championships. Following the Stratos’ retirement, Ferrari’s new V8 powered 308 GTB was Michelotto’s weapon of choice from 1978, since it had already been homologated by Ferrari for FIA Group 4 rally competition and was known to be incredibly agile with its relatively short wheelbase and stable on uneven surfaces. Featuring distinctive colors, high-profile Pioneer audio sponsorship, and exceptionally well prepared cars, Michelotto’s drivers dominated early-1980s European rallying, focusing on tarmac events where they could exploit the strengths of their 308s and score championship points. 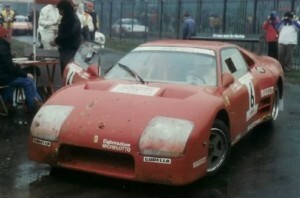 While not (officially) directly involved with Michelotto’s Group 4 rallying program, Ferrari was nonetheless impressed and partnered with Michelotto for a more extreme purpose-built car to contest the new Group B formula, which spurred development of many of the wildest high-performance cars ever conceived. The relatively unrestricted new FIA Group B “evoluzione” regulations allowed Michelotto to take the basic 308 GTB concept to the extreme with the mid-mounted V8 engine turned from the road-car’s transverse placement to a new longitudinal position within the tubular chassis for ease of access to the engine and gearbox. Lowered engine placement also provided a low center of gravity. Production-based underpinnings were modified for competition use. The first chassis was completed in 1983 and the body was constructed from cutting-edge carbon-fiber composite and Kevlar panels from a hand-formed aluminum buck. Quite similar in appearance to the 512 BBLM, the new car’s body was purposefully aggressive with short front and rear overhangs, radically flared rear fenders, a tall rear wing, and plenty of cooling vents. The V8 engine was based on that of the 308 GTB road cars, using the alloy cylinder block and the new Quattrovalvole four-valve cylinder heads, plus competition-spec pistons, cams, and valves. Fuel delivery was via a custom system utilizing a Kugelfischer pump and Bosch injectors. Producing a reliable 363 bhp @ 8,500 rpm, the engine’s power was delivered by a five-speed Hewland competition gearbox. Weighing just 840 kilograms, acceleration was incredible, with a top speed quoted at 270 kilometers per hour. 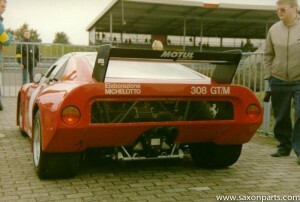 This new Group B missile was designated 308 GT/M, with the “M” denoting Michelotto. The 308 GT/M was relentlessly tested at Ferrari’s Fiorano circuit and as the prototype was wring out, various wheelbases and vital components were tested. Despite the program secrecy, word of the 308 GT/M leaked out and one of Ferrari’s most committed racers, Jean “Beurlys” Blaton of Belgium, who purchased the 308 GT/M prototype car during 1984. The second 308 GT/M was raced just once, at the 1984 Rally di Monza, where driver Lele Pinto demonstrated the car’s great speed and promise, leading the event until a crash forced its retirement. While very quick, the 308 GT/M was soon eclipsed by the new wave of turbocharged, all-wheel-drive competitors that would take rally competition to ridiculous and lethal extremes resulting in the cancellation of Group B altogether after the Tour de Corse in 1986. 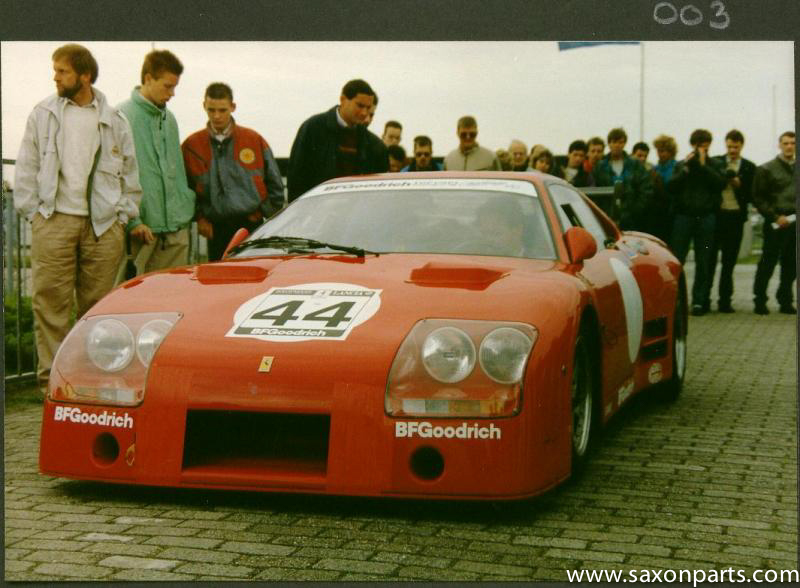 In 1986 a GT/M was built for a Dutch collector, s/n #003; the only 308 GTM certified by Ferrari Spa’s Classiche department. While the racing life of the 308 GT/M was very short and only a small series were built, the program was an important step in the development and DNA of two of Ferrari’s most important ‘supercars’ of the 1980s and beyond, particularly the 288 GTO, 288 GTO Evoluzione, and the shattering F40. The 308 GT/M has always been included in the all time top five most desired Ferrari cars of its era. For me, over 24 years ago when I saw my first 308 GT/M in the flesh, I knew one day we would have to duplicate one. The chances of possessing one of the original cars is pretty slim, but as the legend lives on in some beautifully hand crafted replicas, it should become obtainable. The design is one of perfection and beauty, from its purpose built race design simplicity to the aerodynamic designed carbon composite body. It is such a small car with such a big presence and proved itself as a threat to the famous rally cars of Lancia, Audi and Peugeot and at Ferrari’s Fiorano track this short wheel base monster was even quicker than the Ferrari 512 BBLM V12 racer! You need to be a master of origami to fold yourself to fit in the cockpit, but it fits like a glove! Today following their rarity and growing value we decided to build a replica based on the most original 308 GT/M which now resides in The Netherlands. Over the years we have collected a number of original factory documents of the 308 GTM, from the dimensions and the tubular chassis right down to suspension pick-up points, wiring harness and engine, each designed with Italian precision. 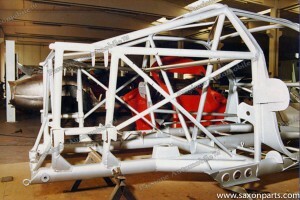 Together with modern day 3D scans and reverse engineering of the original body, chassis and parts, there is enough information to build a very accurate replica of the original. For those considering to buy a continuation 308 GT/M, we consider a very limited edition of only 3 cars. 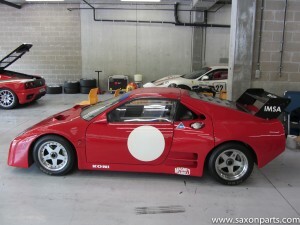 Ferrari 308 GTM project will start when two clients join this unique project. Sorted and equipped with a full roll cage and fire-suppression system. Since the engine is basically a race-prepped version of the basic 32 Valve V8 dry sump used by the regular production 308 road car. Body in composite, highest quality CPDUR German motorsport steel tubing and high performance materials. Engine, chassis, suspension and brakes to highest industry standards. Correct model “OZ Racing” 5-spoke forged alloy wheels with Avon racing tyres and high end exhaust system for the best V8 sound, all for one purpose: the sound, the looks and the thrills of the original. Because parts are still readily available and maintenance is relatively low in cost compared to other classic Ferrari racing cars this is the ultimate track car with an incredible V8 sound! HTP FIA papers would be the final step for these cars and maybe even road registration! – full Michelotto spec V8 prototype engine, 363 HP! The car is immensely versatile and offers an incredible experience and performance while being quite surprisingly easy to drive and forgiving.